No. 5 Georgia is in the Top 5 for the first time since Week 1 of the 2013 season. The dust from a chaotic first few weeks of the season is starting to settle, and the 2017-18 college football pecking order is beginning to take form. 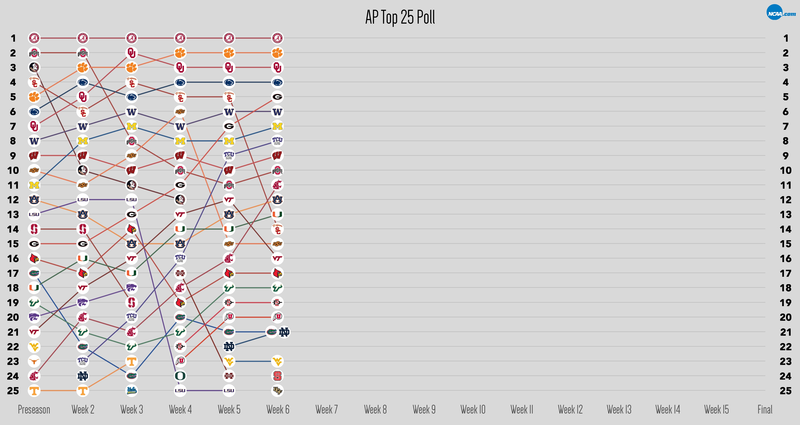 The top four teams stayed put in the AP Top 25 for the third straight week. Seven other teams didn’t move in the rankings. But nobody should be getting too comfortable. There’s still plenty of football to play, and plenty of shakeups awaiting the Top 25. 16-4 — Record for ranked teams in Week 4, winning by an average score of 39-19. Week 5 saw the fewest ranked teams playing this year, as five of the Top 25 — including three Top 10 teams — had byes (No. 3 Oklahoma, No. 8 Michigan, No. 9 TCU, No. 20 Utah, No. 23 West Virginia). Still, No. 16 Washington State took down No. 5 USC 30-27 Friday night, and Saturday saw unranked Troy crash LSU’s homecoming with a 24-21 upset of the No. 25 Tigers. The largest winning margin of the week belongs to Alabama for the second week in a row, as the Tide beat Ole Miss 66-3 a week after pitching a 59-0 shutout against Vanderbilt. The closest game of the week was Washington State’s upset-by-field-goal. In total, 12 ranked teams won by two scores or more, nine won by 30 points or more, and four finished more than 40 points ahead. 8 — Number of conferences represented in the poll (including independent schools). By weighting teams inverse to their rankings (i.e., No. 25 is worth 1, No. 1 is worth 25), the Big Ten comes out in first place among all conferences for the fifth straight week. A week after Ohio State fell to No. 11, the Buckeyes are back at No. 10, giving the Big Ten four teams in the Top 10, more than any other conference. And because the SEC lost two teams in the Top 25 (Mississippi State and LSU), the ACC took over as the conference with the most representatives with five. 18 — Number of teams that have been ranked every week since the preseason. Alabama, Ohio State, USC, Clemson, Penn State, Oklahoma, Washington, Wisconsin, Oklahoma State, Michigan, Auburn, Georgia, Louisville, Florida, Miami, USF, Virginia Tech and Washington State all started the year off in the preseason Top 25 and haven’t left yet. Only seven teams (Alabama, Clemson, Florida State, Ohio State, Michigan, Washington, and Louisville) managed to stay in the rankings wire-to-wire last year. 11 — Number of teams that didn’t move in the poll — the most we’ve had in any week this season. The top four teams held their spots for the third straight week, while No. 5 USC dropped down to No. 14 after its loss at Washington State (Georgia took over for the Trojans, putting the Bulldogs in the Top 5 for the first time since August, 2013). Lower on the poll, No. 6 Washington, No. 15 Oklahoma State, No. 17 Louisville, No. 18 USF, No. 19 San Diego State, No. 20 Utah, No. 21 Florida, and No. 24 West Virginia were all stagnant as well. 9 — The biggest drop in the rankings this week was courtesy of USC. Southern California started the season at No. 4, and bounced around the Top 10 for the first few weeks. This week marks the Trojans’ first time out of the Top 10 this year. It was also just their second game against a ranked opponent this season, next to a 42-24 win over No. 14 Stanford in Week 2. 5 — The biggest jump in the rankings this week, made by Washington State. The Cougars’ win over No. 5 USC was the biggest upset of the week, and its ripples showed in the Week 6 Top 25. After starting the year at No. 24, Washington State is knocking on the door of the Top 10, sitting at No. 11. The Cougars may have a chance to break into the Top 10, with games against No. 20 Utah and No. 6 Washington still left on the schedule. 18 — Spots that TCU has climbed since the start of the season. The Horned Frogs are the only team currently in the Top 10 that started the season unranked. This year, TCU has outscored its opponents by an average of 47.8-18.5 on its way to a 4-0 record that includes a Top 10 win over No. 6 Oklahoma State in Week 4. The Horned Frogs have two games left against currently ranked opponents, with No. 23 West Virginia coming up this week, and No. 3 Oklahoma waiting on Nov. 11. 2 — Number of teams that fell out of the rankings. Mississippi State came into the Top 25 all the way at No. 17 in Week 4 after beating LSU, but lost to No. 11 Georgia the following week and then to No. 13 Auburn last week, the latter of which knocked the Bulldogs back out of the Top 25. LSU started the season at No. 13 and climbed to No. 12 in Week 2, but after its loss to Mississippi State, the Tigers dropped all the way to No. 25, where they stayed until unranked Troy pulled off the biggest upset in Trojans’ history Saturday.